Treasure-hunting team Sam and Remi Fargo's search for a Romanov fortune brings them into perilous contact with an ambitious neo-Nazi clan in the thrilling adventure from the number one New York Times best-selling author. In 1918, a ransom of enormous size was paid to free the Romanovs from the Bolsheviks, but, as history knows, the Romanovs died anyway. And the ransom? During World War II, the Nazis stole it from the Russians, and after that - it vanished. Until now. As the Fargos follow the trail across Europe, Northern Africa, and South America, they know only one thing. This quest is greater than anything they have ever done - it is their chance to make someone answer for unspeakable crimes and to prevent them from happening again. The narrator is the best in the business! The story is a cookie cutter format of the other Remie books in the past! Cannot continue or will lose fans! The book is entertaining but too much like all the rest! Change the counties and treasure—  you have a new book! Moving on from this series! I love the way the authors blend actual historical events into an exciting storyline. As usual, Scott Brick brings the narrative to life with great characterization. I was enthralled from the time I started listening to the end never guessing correct and which would start was going to twist into her totally captivated by the imagery and character development . Great book. I thoroughly enjoyed another adventure with the Fargos! I can't wait for the next one! 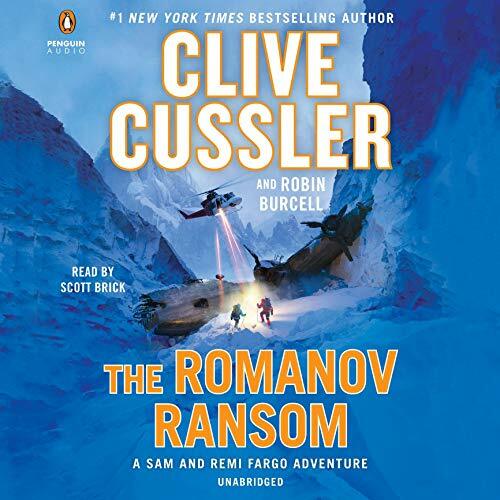 Another spectacular adventure mixing past,present, and speculation from the formidable imagination of Cussler! Jewels paid to the Bolsheviks for the safety of the royal family, nazis still searching for the Amber Room to raise money for a resurgence of their cause, and lots of secret police and spies. Keeps you reading long into the night. Scott Brick continues to be excellent as narrative interpretation. I never thought anyone could take the place of Dirk Pitt but Sam & Remi Fargo are my new favorite adventurers! Scott Brick is my favorite narrator and with the Fargo's searching for more treasure, it is nearly impossible to even pause for just a few minutes. The Romano Ransom is my favorite Fargo adventure so far. The plot has unexpected twists. The characters are well developed. An exciting listen. Cussler doing his thing! Great series. My wife and I love the Fargos. As always a great story. This book has plenty of action. This story was great. It kept you wanting to know what was next. Great read.